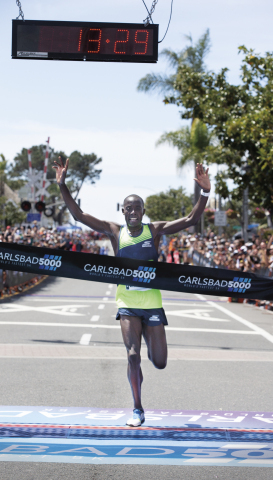 MANHATTAN BEACH, Calif.--(BUSINESS WIRE)-- Skechers celebrates 17-time NCAA national champion Edward Cheserek’s win at the 2019 Carlsbad 5000 in Carlsbad, CA on Sunday, April 7. At the event known as the World’s Fastest 5K, the Skechers Performance elite runner crossed the finish line in 13:29, tying the International Association of Athletics Federation (IAAF) road world record, achieving a new road 5K personal best, and crossing the finish line 25 seconds ahead of the next runner. “This race is legendary, and it’s been a goal of mine to win, and today I not only won, but tied for the road world record and achieved a new road PB (personal best)—it’s a great accomplishment,” said Cheserek, who raced in Skechers GOrun Razor 3 Hyper™ shoes. “With Meb (Keflezighi) now involved in this event, it’s even more special—he’s in a class of his own and he’s part of the Skechers family. Skechers has supported me from incredibly lightweight custom racing spikes to cheering me on today. I can’t wait to race here again next year." Since the inaugural race in 1986, the World’s Fastest 5K has been more than just a catchy tagline. Numerous records have been set throughout the past 33 years, and the Carlsbad 5000 is an ever-tested proving ground for racing. Skechers Performance elite marathoner Meb Keflezighi headlines a group of local running industry leaders who took ownership of the event in 2018. Originally from Kenya, Cheserek attended Saint Benedict’s Preparatory School in New Jersey, where he was named the Gatorade 2013 National Cross Country Runner of the Year, before choosing to continue his collegiate career at distance running powerhouse, University of Oregon. In 2013, Cheserek became the first freshman in school history to win the NCAA National Cross Country Championships, and would then go on to repeat as cross country champion in his sophomore and junior years. By the end of his collegiate career, Cheserek was the winningest male athlete in NCAA Division I athletics’ history with a combined 17 national championships in cross country plus indoor and outdoor track and field. After going pro in September 2017, he set a new PR in the indoor mile with a win at the 2018 Boston University Valentine Invitational. Wearing custom Skechers GOrun racing spikes, his time of 3:49.44 placed him at #2 all-time on the world record list for that distance. Since its debut with the first model of Skechers GOrun worn by Meb Keflezighi in 2012, Skechers Performance footwear has earned respect throughout the running world and won numerous awards within the footwear industry—including the Skechers GOrun Razor 3 Hyper™ recently being named Editors’ Choice by Runner’s World. The entire Skechers GOrun collection for men and women is available at Skechers retail stores and skechers.com as well as select retail partners.